The process of heating liquid to the temperature at which it will begin to transform into a gaseous state, which is 212ºF or 100ºC when water is boiled at sea level. In cooking, it is easy to tell when a liquid reaches the boiling point because gas bubbles appear on the surface of the liquid and steam rises from the cooking vessel. 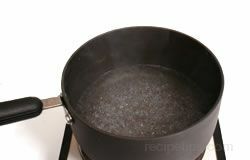 There are different levels of boiling in cooking such as a fast or vigorous boil required for cooking pasta or potatoes and a slow boil or simmer which is required for many other food items. In addition, a rolling or roiling boil involves the process of heating liquids to a temperature where stirring will not alter the turbulent or vigorous bubbling action. Another term associated with boiling is "parboil" which is the cookng of food in boiling water for only a short amount of time to retain the color, to help preserve the nutrients and to firm various foods, such as vegetables. Parboiling is also used to prepare vegetables for canning or freezing and to tenderize them for further cooking processes. A parboil procedure involves placing small quantities of food into a large amount of rapidly boiling water for the amount of time specified in the recipe. Food is added in small quantities so that the boiling process is not disturbed or decreased. If the food is not to be cooked again or if it is not to be served immediately or if it is to be canned or frozen, then the food should be plunged into a cold water bath (shocked), after being removed from the boiling water in order to stop any further cooking action. However, if further cooking is to occur immediately thereafter to the food just boiled, a cold bath is not necessary. This process may also be referred to as parcooking or parblanching. For years there have been theories about boiling water that have been handed down from generation to generation. Several of those concepts include: 1)that covering a pot of water with a lid enables water to boil faster, or 2) adding salt to the water will decrease the time required to boil water, or 3) cold water will reach boiling temperatures faster than hot water. None of these theories have much evidence to support their practice. A lid keeps the heat from escaping, which will actually decrease the time required to boil water, but only by a very small amount of time. Adding salt makes the boiling time slightly longer, while the use of cold water increases the amount of time required for boiling, not decreases. When boiling water, always be careful to guard against spillage or exposure to skin which may cause a painful injury.